There can be few phenomena forged by humankind which impart emotions similar to those which rise when you witness a space launch. 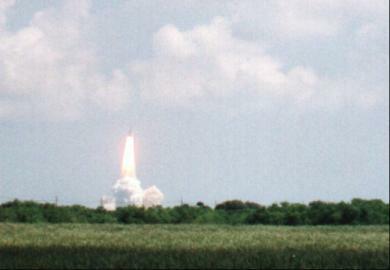 Therefore an event of the magnitude of a space shuttle launch must elicit a particularly keen sense of awe. NASA have almost managed to make the space shuttle's launch into a 'routine' event, despite the newsworthy tragedy of Challenger reminding us all of the tremendous forces and risks involved in lifting over 100 tons into space at a speed of 5 miles per second, so it is worth remembering that it is one of the largest launch events EVER! It matches the thrust of that behemoth from the sixties, the Saturn V and only the Russian Energiya packed a bigger punch successfully. 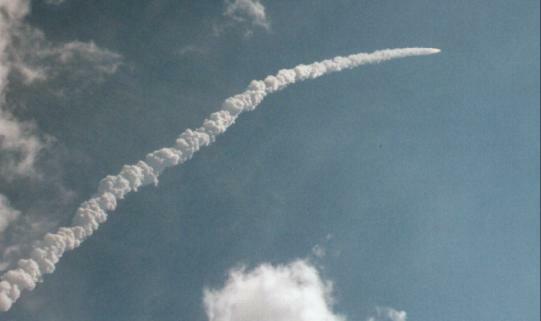 In June 1996, the opportunity to watch one of the world's most spectacular firecrackers was not to be missed. Me and my family were delighted to acquire a pass to the family VIP viewing area at the Static Test Road site in Kennedy Space Center. One of the perks of the VIP pass is a complimentary tour to the launch pad and around the space center the day before launch. Having obtained our bus pass for this a couple of days earlier, we showed up at the Visitor Center, Room 2001 at KSC when we were due. Anne and the boys headed for the Play Station Alpha, a covered play area next to the Rocket Garden, which soaked up a lot of my 8 and nearly 5 year olds' energies. 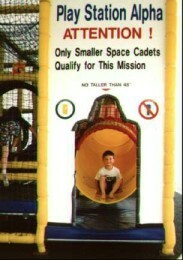 This play area was only added recently but proved to be most useful when kids start getting bored and Dad wants to go and look at another few examples of space hardware. While they played, I attended a talk on the upcoming mission given in one of the IMAX theatres. Next, it was to the buses which had parked in front of the car park. As I had been in touch with one of the VIP guides, Mrs Julie Clements, by email beforehand, she suggested we look out for her as she would be on duty as a guide that day. We located her, exchanged greetings and boarded her bus for the tour. 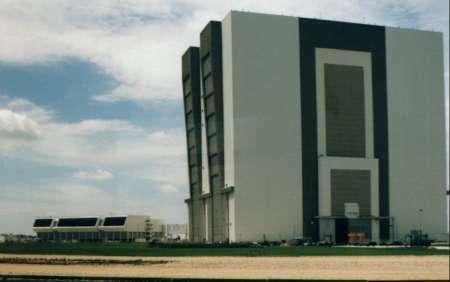 It is perhaps unfortunate that the VAB sits almost alone in the midst of flat, palmetto land for there is nothing around it which conveys the extraordinary scale of this building. An oft quoted attempt to do so claims that if you could put the UN building on wheels, you could take it through one of those doors and out the other side. We passed the Vehicle Assembly Building with its deceptive scale and continued to one end of the Shuttle Landing Facility. This 15,000 ft by 300 ft runway is, however, best appreciated from the air. On the ground were a few executive jets, T-38s and the mate/demate facility with which the shuttle can be lifted on and off the back of a modified Boeing 747. The T-38s are the astronauts personal transports with which they scoot around the continental United States while simultaneously keeping their flying reflexes sharp. 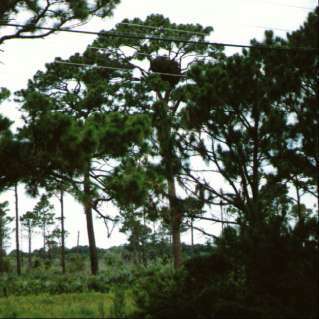 A favourite of staff at the Kennedy Space Center is this huge eagle's nest propped within the branches of a tree. The road leading to the launch pads combined the excitement of space technology with a rare look at nature as we caught a glimpse of a wild manatee in the water and passed a tree containing a huge bald eagle's nest; a great ball in the branches about 2 metres across. It was explained to us that seeing a manatee meant we probably wouldn't see an alligator as as the manatee tended to keep out of their way. Space operations require huge amounts of unpopulated land because of noise considerations and the possible effects of accidents with large quantities of exotic and explosive propellants. NASA has put this land to good effect by having it designated a wildlife refuge. Certainly the animals don't seem to mind the occasional shuttle going up. Pad 39A was, we were told, being refurbished and the bus took us there first, driving right up past the hydrogen burn pond towards the cavernous, scorched flame trench with its flame deflector. Pad A is a historic site if ever there was one. From here, Apollo 11 with Neil Armstrong, Buzz Aldrin and Michael Collins set out on the first journey to visit another planet, the Moon. Eleven other Saturn V launches departed from here, seven of them to take men to the moon. It is sad for me to realise that this happened over a quarter of a century ago with no progress since. 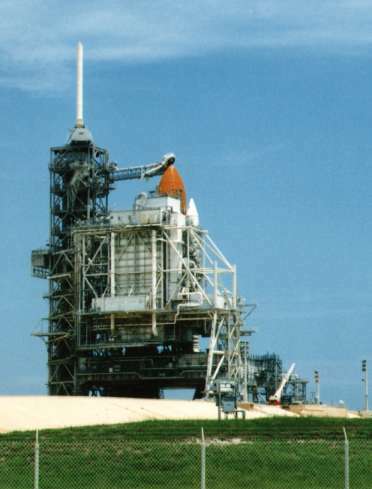 Only one Apollo/Saturn V mission was launched from Pad 39B, Apollo 10 in May 1969. The final, fatal Challenger flight left from here in January, 1986. Now Columbia was awaiting its 20th flight to the vacuum beyond Earth's atmosphere and we were going to have a look. 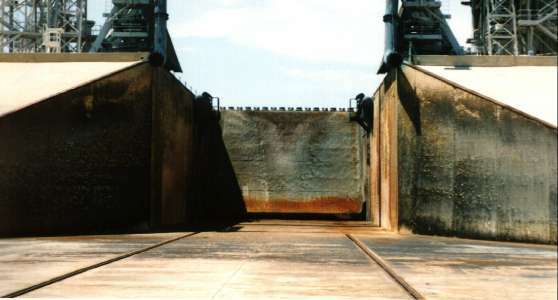 In bright sunshine and blue skies, we passed through the gate into the launch pad area itself and left the bus. I was disappointed that the rotating service structure was in place over Columbia and the orbiter was therefore invisible behind this protective canopy. Nonetheless, the tan coloured point of the bulbous External Tank and the sleek, white tip of the starboard Solid Rocket Booster spoke of the majestic, if unlikely looking flying machine within. Photos were taken - I'm not going to go on a visit like this and not keep it for posterity - and my wife gave me a minute or two to savour the moment... then back to the buses. We had just got settled in our seats when a couple of sports cars drove slowly past. The crew of STS-78 had come out to wave to us and do their PR bit for NASA. Well done NASA and I hope the six men and one lady in the team were as happy to carry out this gesture as I was to be a recipient of it. It was less than twenty four hours before launch and some, if not all the crew must have been highly focussed on their fortnight ahead. Perhaps the PR is part of a near launch wind-down to keep their minds fresh and rested for their flight. Traffic into KSC was not as bad as we feared though we did leave Kissimmee very early - just in case. As the lines of cars were ushered on to the NASA Causeway viewing site, we chuckled when we came upon the turning to the Family VIP site along the Static Test Road. A few hundred folk, at most, were administered with mosquito repellent by friendly staff and we set ourselves up with cameras and food for the morning. I placed a video camera on its tripod and felt an edge of disappointment to find that Pad 39B appeared so very far away. Loudspeakers kept us informed of progress at the pad while the family settled down to waiting. I struck up conversation with folk next to us and found that they were related to one of the crew. This appeared to be the case for most of the people here. I had read that you should either go to see a launch, or go to photograph it; everything happens to quick for you to do both. I reckoned that with my experience, I could do both. 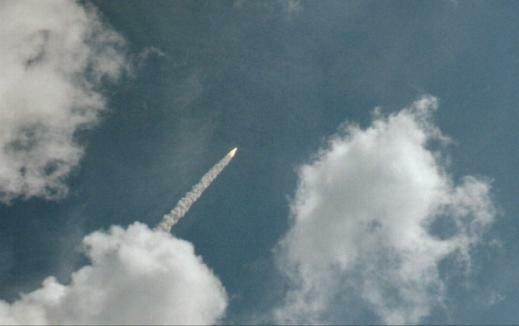 The video camera would be tight on the launch and I wouldn't have to look through the viewfinder as Columbia ascended. Then I planned to press the zoom control to widen it's view, grab the tripod's handle and roughly point the camera in the right direction - letting its wide angle view take in the shuttle. All the while I would experience the even with my eye; maybe taking a couple of 35-mm snaps in the way. Countdown progressed in the Sun and the heat. I started the video with 90 seconds to go. I hardly believed it was going to go at the first attempt. As the count got to three seconds to go, I thought they were going to call a halt when clouds of white steam began billowing in our direction. Behind it, Columbia's stack began rising in silent majesty, eventually rising out from behind this man-made cloud. "Go!" I shouted involuntarily, waiting to see something. When it came, I was astonished at the spectacle which greeted me. The exhaust plumes of the Solid Rocket Boosters are so hot and emit so much near-infrared energy that I had never seen a photograph, film or video which had shown them as they appear to the human eye. Instead of brilliant white, they are a vivid, vibrant, bright orange colour. Within seconds the cone of orange had entered into a small, local cloud, giving us all a respite from the spectacle. I started the video zooming out and waited for Columbia to reappear. When it did, it was spectacular - and fast! People around were whooping and hollering when it came. A full 25 seconds after launch, a low roar began, closely followed by a crackling, rippling thunder that drowned out even the announcer. Not ear-splitting, but impressive nonetheless. Meanwhile the rocket's column of smoke from the SRBs climbed heavenward and the drift of this smoky train in the high winds was apparent. I snapped a couple of photos and let the video do its stuff. A lovely sight to have seen and to have let my sons see. At last, there wasn't so much to view with the naked eye so I finally went to the eyepiece of the video and zoomed in as far as it would go, just in time to see the SRBs disconnect from the vehicle and fall away. The three main engines were all that was left of the vehicle and they appeared as nothing but a glowing, moving star against the blue sky. I was chuffed to bits. I couldn't have got more out of that launch. I smiled even more when I heard someone nearby complain to their group "I saw the whole thing in black and white." Apart from the sound, he might as well have been across the Atlantic as he had his eye to a pokey little viewfinder for the entire spectacle.